One feature which Android users have been asking for long was the ability to sync bookmarks with Google Chrome web browser. But now thanks to a nifty app called “Chrome to Phone” by Google, you can now send URLs / links from your computer running Google Chrome browser right to your Android device running Android 2.2 Froyo. “Chrome to Phone” extension on the computer basically pushes your websites from Google Chrome right on to your Android device, and from there your device completely takes over, for Maps it launches the Google Maps app, and for YouTube, it launches the YouTube app and other apps accordingly. 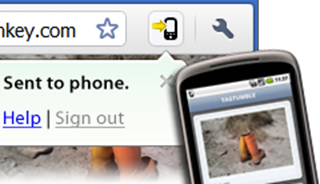 You will also need “Chrome to Phone” app installed on your Android phone in order to receive the URLs.